These are very rarely called Olive Quill Spinners. 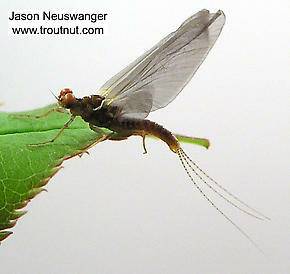 For trout (if not anglers), this single species is arguably the most important mayfly in North America. In terms of sheer numbers, breadth of distribution and hatch duration, it has a good argument. Ephemerella excrucians or Pale Morning Dun usually follows its larger sibling Ephemerella dorothea infrequens with which it shares the same common name. What it often lacks in size by comparison is made up for with it's duration, often lasting for months with intermittent peaks. This close relationship with infrequens has led many anglers to confuse Pale Morning Dun biology with that of the multivoltine (Multivoltine: Having more than one generation per year.) Baetidae species, having disparate broods that decrease in size as the season advances. Sharing the same common name has not helped to alleviate this misconception. Until recently, Ephemerella excrucians was considered primarily an upper MidWestern species of some regional importance commonly called Little Red Quill among other names. Recent work by entomologists determined that it is actually the same species as the important Western Pale Morning Dun (prev.Ephemerella inermis), and the lake dwelling Sulphur Dun of the Yellowstone area, (prev.Ephemerella lacustris). Since all three are considered variations of the same species, they have been combined into excrucians, being the original name for the type species reported as far back as the Civil War. Angler speculation had simmered for some time that the stillwater loving Ephemerella lacustris was much more widespread, inhabiting more water types then previously thought and could account for many large sulfurish ephemerellids found in still to very slow water locations throughout the West. With the revisions, this discussion is now moot. Ephemerella excrucians variability in appearance, habitat preferences, and wide geographical distribution are cause for angler confusion with the changes in classification. 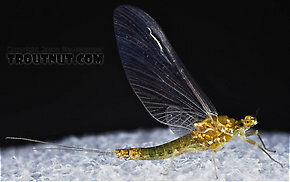 They can be pale yellow 18's on a large Oregon river, creamy orange 14's on western lakes and feeder streams, large olive green on CA spring creeks as well as tiny sulfur ones in many Western watersheds. Then there's the little Red Quill on small streams in Wisconsin. Yet, all are the same species. Ephemerella excrucians (Pale Morning Dun) Mayfly Nymph View 5 PicturesI spent (Spent: The wing position of many aquatic insects when they fall on the water after mating. The wings of both sides lay flat on the water. The word may be used to describe insects with their wings in that position, as well as the position itself.) a while with a microscope to fairly positively identify this specimen as Ephemerella excrucians. Broods: When a species produces more than one generation per year, each one is called a brood. Multivoltine: Having more than one generation per year.